I was looking for number of contracts for weeks and was like.. why is there not single one? They talk about Coil but I feel it is like xrapid.. you know it is there somewhere but it is has no influence on price. Xrapid adoption is extremly slow. Volume on xrapid exchanges is pathetic. Mercury fx sends tens of thoudans monthly which has no influence on price. Bitso volume is funny. Ripple dumping 100 millions when price is at -90%. One of the smartest people in Crypto and creator of xrp out of nowhere decides he must reduce his risk because he agreed with his wife to do so. No, I didn't mean to imply that. What turned out to be regulatorily impossible was creating a compliant "gateway" business in the original sense we used the word gateway. A "gateway" in that sense was effectively an entity acting as a bank on Ripple. These entities would take real world fiat deposits through the local banking system. Then they would "issue fiat balances" (AKA: credit your account) on the Ripple ledger. You can rationalize them as a "gateway" between the traditional banking system and Ripple's ledger through which money flowed. However, the real reason they were called gateways is because lawyers told us, "You can't say 'bank'. Nor can you say 'like a bank'" So they needed a new name. Hence the naming rationalization. Impenetrable naming of our concepts has been one of Ripple biggest barriers to adoption. Compliant gateway business became "impossible" to launch because regulatorialy they fall under a class of "money transmission" business. It turns out this type of company is regulated independently by every state in the US and by every country internationally. They require separate licenses and posting significant financial bonds in every territory. That is one of the reasons that Ripple pivoted towards actual licensed banks rather than attempting to encourage the creation of new gateways. @lucky This topic is really worth its own thread. If you are still interested in the topic, please create one and invite me to comment. I don't think the internal exchange is a dead end and I don't think it will be removed. In fact it has some significant advantages over the current xRapid architecture. However explaining why takes more than a couple of sentences. xRapid is a great product, but my personal opinion is that it still has too many steps for a bank to use XRP. it works well within the use case of NBFIs though. Your description of the original use case for gateways is very enlightening. I understand that it is financially and logistically and from a regulatory perspective very difficult for Ripple to maintain these gateways. But what if banks take responsibility of their own gateways and do their bridging directly on the XRPL DEX? We know xCurrent can now settle with XRP, so could this be a possible workflow in the future? This does not contradict me. You can open a gateway for XRP (this is what all off-chain exchanges do) and the back-end of such a system can be realized with a network of rippled servers. 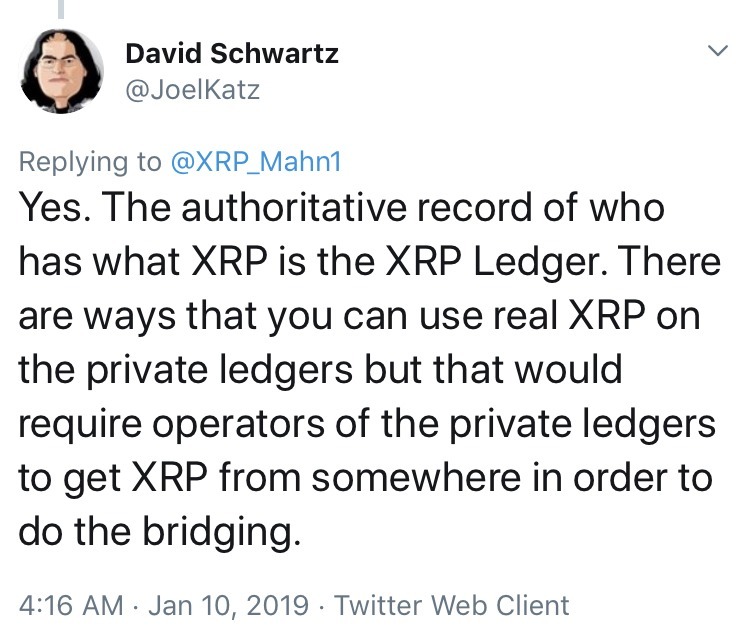 These would still not be "real" XRP, but XRP IOUs held in custody by the gateway (or "bridges" in the sense of David's tweet). @BobWay might as well ask you directly the original theory about the "Hidden ledger" before it was distorted by the Twitterverse. This approach reduces the strain on the public ledger, gives privacy to sensitive transactions and allows the parties involved to set a price that makes the asset as liquid as they want. - Is this technically possible? - If yes, is anyone possibly doing this as we speak? I have one more question if you don’t mind. Do you think, whether by design or by chance, that XRP can turn out to be the leading reserve asset/ currency and not just the leading bridge asset/ currency? i.e. entities stockpiling it and not just use it for on demand liquidity? I give it 48 hours until we see crypto blogs stating, "10 will be using it in June". The default for Worldwire is XLM though, IBM has stated that. X-rapid can use other cryptos as well, but it just prefers XRP. Corda XRP settler could create payment channels, yes? There are enough other metrics to distinguish character like: nickname, post count, colour. I feel sorry for people that only use avatar to identify identity, its really more their personal problem and requires a work on "attention to details". @Tinyaccount its very unprofessional and sad to create poll and than giving out on opposition like "who that other 15 people" it just proves that your post is more target to atack personality rather than identify issue. Same can be said that 50 people are your beloved club members, that blindly support anything you post in your favor. @zenkert first comes policy than actions. I clearly remember that you and some other member were using same bull head avatar at some point, everyone was happy, because everyone is bro, bro allowed double standards. @KaaKaRmA is more nemesis of @LilBender rather than a obfuscating copy. The latter did not patent trolling, so former allowed to troll the way it likes. It has different name, it has different copy and behaves differently. But anyway it interesting, when it comes about XRP $5 EOY, than all of you just bits under animated images, but here you claim that your image is identity that matters! The instant payments that the OP is referring is only applies within the SEPA zone - and they do cross-border transfers exclusively in Euros. Why would they use XRP for Euro-to-Euro transactions? Makes no sense. Oh... and please answer why exactly you did it. Or is the answer too revealing? Is there any possibility that a mod like @karlos can clean up this thread from all these useless comments (including my responses to them). Since this thread offers a lot of valuable information but gets destroyed by some people who think they are extremely funny and wit by provoking me again and again and again just because I lay out some undeniable facts. Everybody reacts differently I guess. If these guys would act the same way they do here in real life, we might get into serious trouble. And they won't do it in real life for 100%. Now here, hiding behind their screens, they can act cool and all that. So yes there might be people who just ignore it when cockroaches approach them, but I am not one of them. Look, I get that you are trying to be super cool and funny and your xrpchat.com crew is laughing really hard. I am not stupid. If you think that you can troll in this thread and provoke me without any answer, you are wrong. You play the role of a ****** little troll who thinks he is cool destroying a valuable conversation with stupid comments. And for that I will call you ******** again and again and I don't ******* care if this is against any rule or not. Are you calling me a six star, seven star or an eight star? Yeah of course. Much funny. Keep destroying a thread which is actually a real great discussion of how xRapid can create value of the XRP token with your stupid comments. In fact, there is so much valuable information in this thread that everyone who is interested in how xRapid works and how the value of XRP will be derived should read it. But yeah, keep ******* with me. You are a really cool veteran member of this board. Great achievement. and as long as guys like you exist on this forum I will keep calling them shitholes. @karlos time to ban me, right? calling me "snowflake", "sweetheart", making comparisons to this philakone dude. I really don't care how some pseudo experts call me on the internet, but don't expect me to be friendly and nice if people are spreading wrong information and if I correct them they are telling me I do not have any financial knowledge at all. This is like telling a musician he has no idea of how musical instruments work. I am pretty sure all these guys who were provoking me and were spreading wrong information didn't get any warning, right @karlos? But yeah, I take this warning point with pride. Yeah, this is why I am sitting here without a job, just living from my trading income which I gathered the last years. Lol was waiting for you to come along. Is the robot on his way as well?